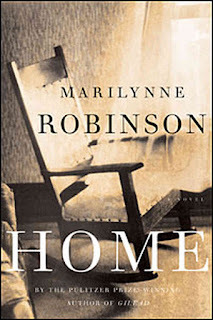 At the end of my post on Gilead, I wondered if Marilynne Robinson, in focusing on the human aspects of divine love in her fiction—tenderness, compassion, etc.—somehow diminishes grace by equating it with human emotion or feeling. The second book in her trilogy, Home, told from the perspective of Glory, the daughter of Rev. Boughton and sister of the prodigal son Jack, draws us closer to an answer. If Jack is the prodigal son, Glory, his youngest sister, plays the role of the elder son, the one to whom the father in Luke’s parable says, “everything I have is yours.” Glory is the loyal child, a middle-aged, single woman who has moved back home to care for her aging father. Jack returns after a twenty years’ absence, harboring secrets known to the reader of Gilead but not to Glory or their father. Glory, too, has secrets that she would prefer to keep hidden, and the siblings’ pasts bubble under the surface of daily kindnesses that constitute their life together under the same roof. A good part of the novel is a catalogue of stumbling encounters between Glory and Jack, as each tries to make apologetic inquiries into the other’s darkness. Robinson is the ultimate poet of the commonplace, and she does a fine job here of depicting the slow, often halting, understanding that emerges between two adults whose life experiences are largely hidden from each other. In the parable, Luke does not show us the older brother’s reconciliation with his profligate sibling, leaving us to imagine how it might happen, if at all. Robinson, in Home, allows us a glimpse of such an imagining. Reconciliation in this novel (both between Jack and Glory and Jack and his father) is not something that occurs at once, as if we were transported into Rembrandt’s painting, but something that is hard work and that proceeds in fits and starts. Jack is a prodigal son whose decision to come home is but the first motion at reconciliation. It does not mean, for example, that he has rid himself of his vices or his grief. And though both his sister and father welcome him home, it likewise does not mean that they are rid of their suspicions of his behavior or their anger at his absence. There’s something profoundly real in Robinson’s depiction of the Boughton family’s struggle at giving and accepting love. In the novel clean edges are hard to come by, and rightfully so. Glory and her father welcoming Jack home does not mean erasing the past, or disinfecting the present with their good intentions. It means living with worry when they hear Jack go out the front door in the evening, and nursing him back to health when he relapses into an alcoholic despair. This is what forgiveness and understanding really looks like in the broken world of human behavior. Despite all of this, I began to tire of Home as I made my way through. The halting conversations and missed connections came one after another, and for the better part of the novel, don't seem to develop the plot, or our understanding of the characters. Jack, describing how he has always felt like an outsider in the family, says at one point, “Sometimes it seems as though I’m in one universe and you’re in another. All of you.” This line could describe all of Robinson’s fiction—her characters never seem to transcend their own isolation, and only through kind actions can they achieve a respite from their locked-in syndrome. Everydayness rules, and nothing really seems to happen except in character’s heads. In my first post I mused that this approach contrasted with that of Flannery O’Connor, who was bent on disrupting us, jarring us out of everydayness, showing us the workings of grace by using a sledgehammer. Just when I was about to write off Home as one of those novels in which nothing really happens, Robinson’s narrative turned fierce. The Rev. Boughton, in his last few weeks of life, becomes a sort of mad King Lear, forgetting things and prone to outbursts. For the entire time that Jack has been home the elder Boughton has been reluctant to utter anything except kind and welcoming words, even blaming himself for Jack’s waywardness. Yet near the end, Boughton claims not to recognize his son, holding a candlestick and peering into his face like a Shakespearean fool, then excoriating Jack for abandoning the child he had fathered with a poor teenage girl years ago. It is as if, in deteriorating into madness, the Rev. Boughton finally finds the courage to speak the harsh truth to his son. As his siblings start to descend on the house for their father’s last days, Jack decides to make his exit, because he can’t trust himself to stay sober in his father’s final hours, and wants to spare everyone the sight of him. But before he does so, Jack comforts his father, cleans him, changes his sheets, and carries him to bed. His father seems too far gone to know it, though. Something has changed in him, Robinson seems to suggest, and Glory notices it too—a gentleness that was striking to her, though “she had always known him to be gentle.” When he offers his father his hand when he leaves, his father rejects it, and Jack bends to kiss his head. After he is gone his older brother Teddy arrives, a responsible, honorable physician. As Teddy tends to caring for his feeble father, the Rev. Boughton thinks he is Jack, and says “you told me goodbye, but I knew you couldn’t leave.” This Robinson at her finest—a missed connection disguised as a reunion, a joy run through with sadness. The novel ends on another missed connection—Jack’s wife, after a long silence in written correspondence, visits the Boughton house with their son, looking for Jack, only to find that he has gone. Glory invites them in, but they do not enter the house, and must leave to return to their town by nightfall—they are African-American and fear being out at night in a white area. Jack’s wife hands her a letter for her husband, but it is doubtful if it will ever end up in his hands, as Glory does not know where he has gone. But Glory's imagination now possesses Jack’s family, and she thinks of his son (named Robert, after their father) coming back one day to the house, furnished as it still was when they were young, “and the place would seem changed, to him [Jack] and to her. As if all that saving and keeping their father had done was providence indeed, and new love would transform all the old love and make its relics wonderful.” Perhaps in this sense, Jack, who his father says never felt “at home in the house where he was born,” might finally come home. Perhaps, Robinson seems to suggest, it’s the best reunion we can hope for amidst our brokenness. The fierce end of Home redeemed it for me. For all of her emphasis on the tenderness of grace, Robinson’s depiction of the feeble, crazed Boughton shows its ability to disturb as well as console. Next up, the final book of the trilogy, Lila, whose protagonist is the Rev. Ames’ young, unschooled wife.